Greetings from the forward lounge of the cruise ship ‘Sea Adventurer’. It’s Sunday, I think, and we are a week into a two week ski adventure on the Antarctica Peninsula organized by Doug Stoup and Karyn Stanley of Ice Axe Expeditions. 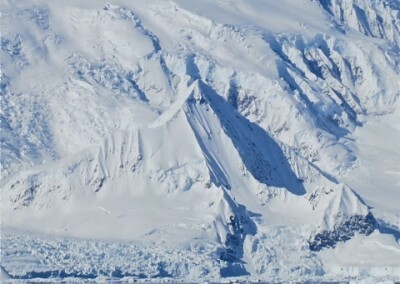 This is the 3rd “Ski Cruise” to the Peninsula, and including my 2009 month-long sailboat trip, my fourth trip down here to ski. 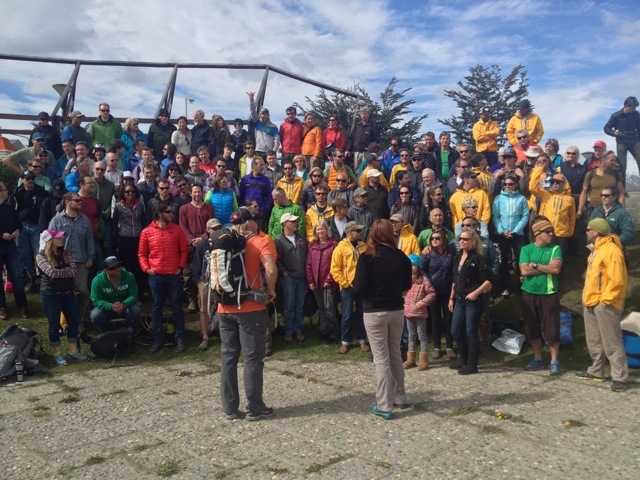 The group is comprised of just about 100 clients and 21 mountain guides, including Scarpa guides and athletes Doug Stoup, Angela Hawse, Kris Erickson and myself. 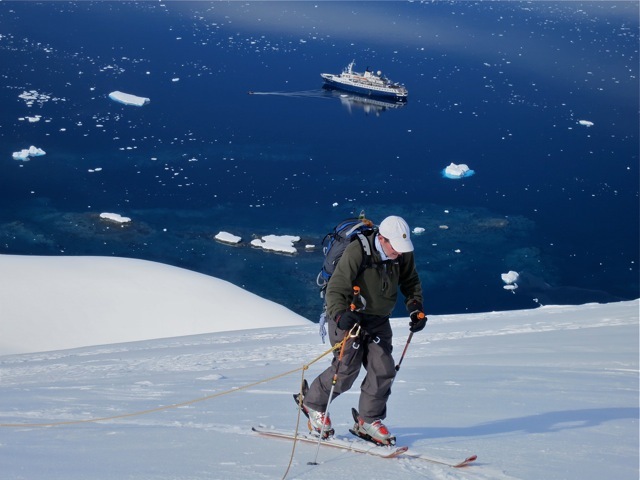 Our mission, and it’s an easy one, is to share our collective passion for this unique and special place with our guests, on the mountains, the water, and on the ship. 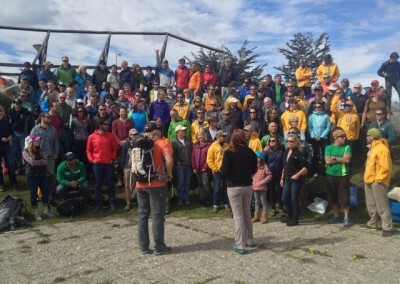 The guide team is comprised of very talented and inspired individuals, all whom love sharing their knowledge and love for the wild places on Earth. This trip is a one-of-a-kind experience that is only offered by Ice Axe, and I’m proud to be a part of it. 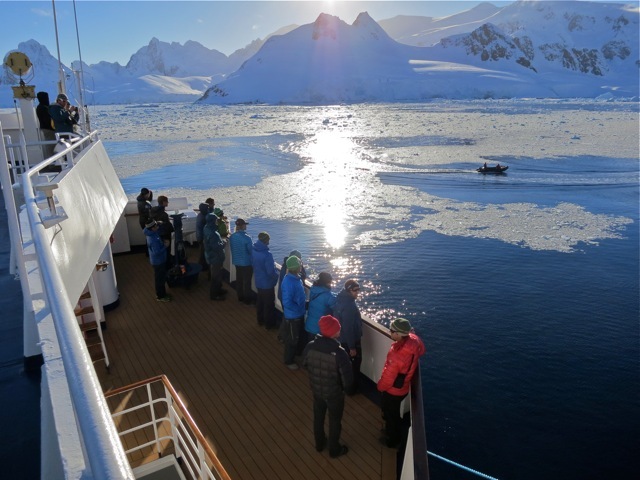 We also get to enjoy the vast knowledge and experience of the ship’s expedition staff, a fine group of geologists, ornithologists, marine biologists, historians, and naturalists. A normal day of ski operations looks like this. Guides are up at 5:45 am for a 6 am guides meeting on the upper deck. 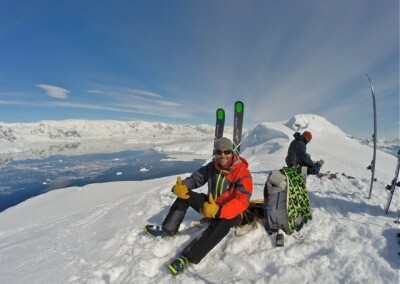 Doug presents the ski options for the morning or the day and we inspect the objectives with binoculars and decide on a few landing sites with safe access up onto the glaciers and ski terrain. 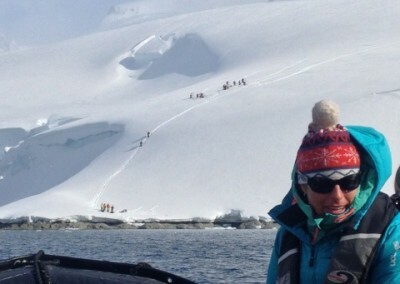 By 8 or 9 we have Zodiacs in the water and the expedition staff begins shuttling the ski groups to the shore. 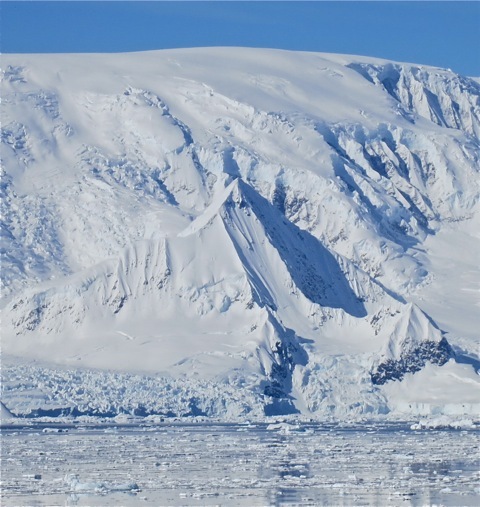 Inevitably there are penguin rookeries with Gentoo, Adelie, or Chinstrap penguins at the landings, which makes for fun and sometimes interesting navigation up through the masses. 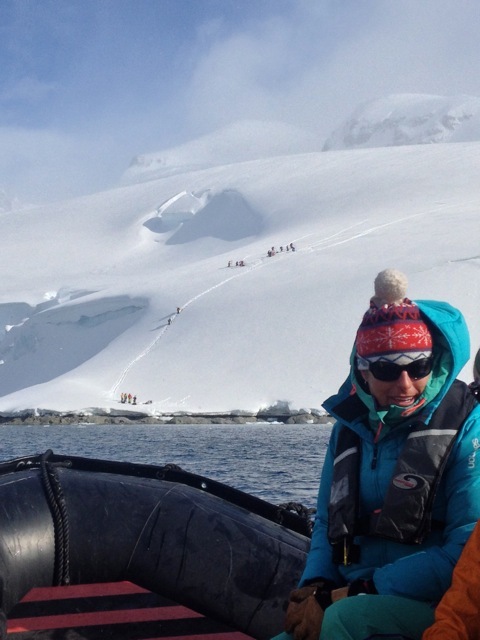 (Penguin guano and climbing skins don’t go well together) Our team ropes up to ascend the glacier and most climbs take an hour or two. As you can imagine, it’s a wonderful feeling to skin at sea level, and we make quick progress upwards. 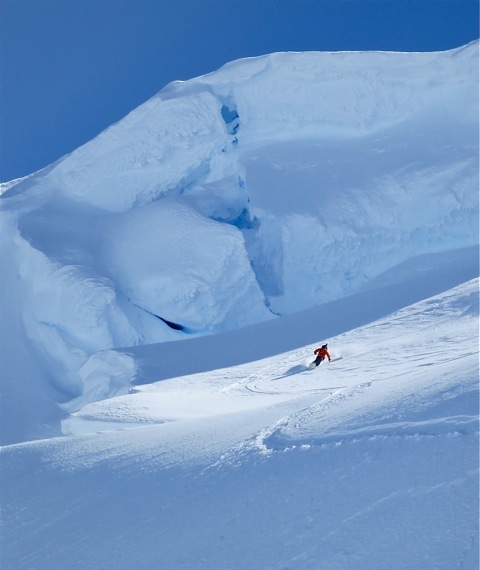 Even though there are varying degrees of skill and experience amongst our clients, there are always fantastic ski objectives for all abilities. 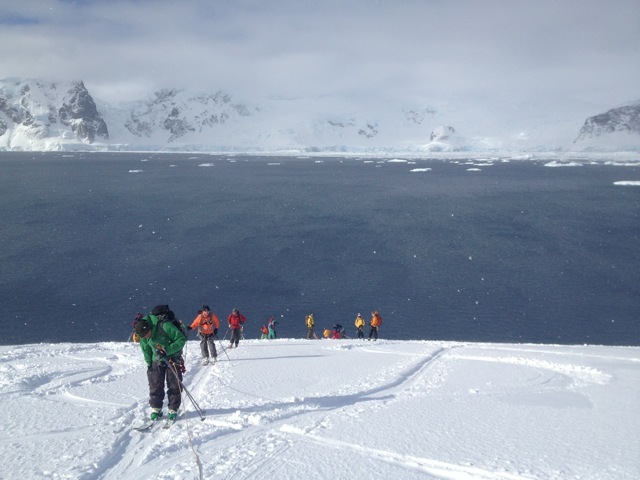 The advanced groups sometimes end up getting on some steep and wild terrain while the more inexperienced ski mountaineers ascend broad shoulders and ski great snow in wide bowls. After the mornings skiing we often times will come back to the ship for lunch in the dining room (the food is awesome) and the ship will transit for an hour or two into a new bay with new objectives for the afternoon session. 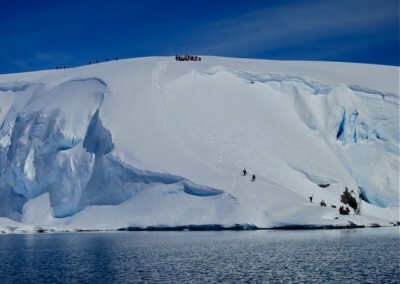 We will cruise to shore again, sometimes stopping to inspect the large icebergs or a seal sitting on some brash ice, and begin another ascent to a final objective. By 7pm we are back on the boat for a hot shower and another fantastic meal. Evenings are spent watching slideshows by the guides, ski films, or reflecting on the days experiences over a glass of scotch with a few rocks of many thousand year old glacier ice dropped in for good measure. 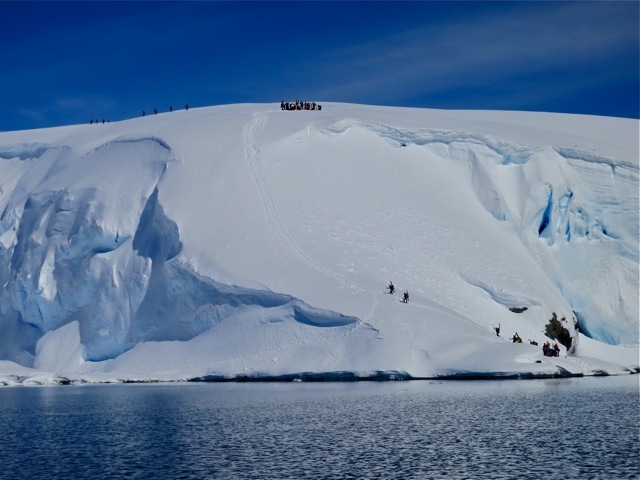 The Ice Axe team is already planning the next Ski Cruise, which will take place November 5-17, 2014. I’ll be back again because this place calls my name in a way no other place ever has for me. If skiing is your passion and adventure permeates your soul, then think about joining us next year for this trip of a lifetime. www.iceaxe.tv for more info. Thanks once again to Doug Stoup for having the vision and commitment to make such an incredible journey happen. The team gets a final briefing in Ushuaia before departing. Early morning guides meeting on deck to discuss the days objectives. Approaching the shore in the Zodiac. On this landing we boot pack up the short pitch before switching to skins. Another look at a typical shore landing. 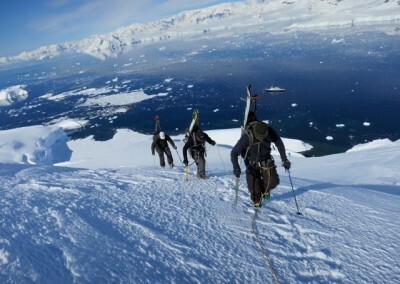 Steep for a bit then easy skinning up the glacier. Skins on, ready to climb. Client Bruce Cummings skinning up the glacier with the Sea Adventurer below. The final push to the top. There is our ship in the bay below. 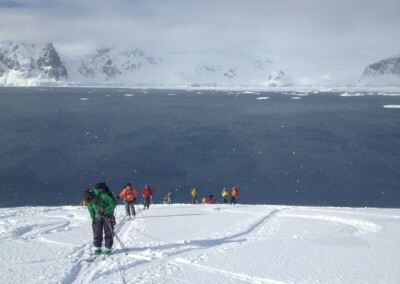 On the summit at Nansen Island on a perfect, blue-sky day. 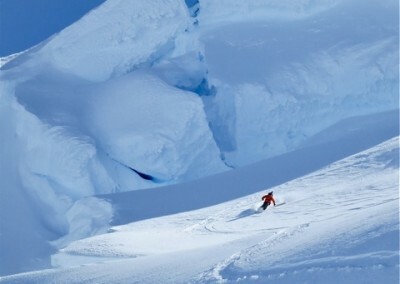 Client Joe Campbell skis great snow below the summit seracs. 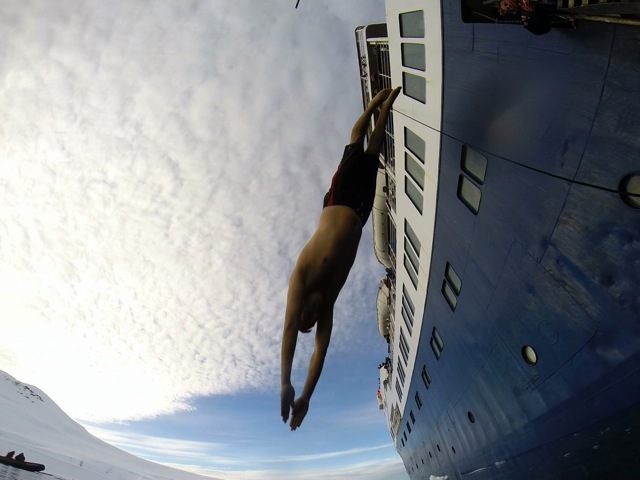 And no trip to Antarctica would be complete without the “polar plunge”. Client Abdur Chowdhury dives in!